I have an introduction to make, officially! You've probably noticed I've changed my name online and you've maybe even noticed that my website is a different name. OK let's talk about it. Cool? First off is a few people have asked me - "WHY? I loved arrow + apple." I loved arrow + apple too. I loved it because I originally chose it as the business name for my photography business! Years ago I learned I couldn't use my *actual* name, as there was another photographer with my same name already using a variation on our name as their business (not mentioning any names! Hah sorry that's a joke. Never gets old to me) so I had to get a little more creative. The name arrow + apple hit me as we were traveling and I was thinking about the story of William Tell, and how crazy it was that his son trusted him to shoot the apple off of his head with the arrow. And then I was like, oh I hope my clients trust me to shoot them, too! And there it was. And it was perfect for what my business was at that point. A re-name + re-brand was in order. Oddly enough, the name Paro came to us again while we were traveling! What is it about breaking out of your routine that helps your brain refreshen!? Whatever it is - I'm so glad. We had been thinking for weeks and found a few options but nothing that a) I loved, or b) felt meaningful. As we were driving on the road I started to think about my love for decorating and redoing homes and wondering if this seems super shallow and surface to God. A lot of people would probably argue that it is. There are so many things going on in this world that are so much more important than renovating homes. Things that matter more to other people, and greater needs are being filled. I've had conversations along these lines with several friends lately, and I always end up feeling like I justify my love or my "gifting" somehow, but I still secretly wonder if I'm making the Lord happy at all with this business that I love. I really want to. When we were in Georgia, I was riding along with my cousin's wife Amy and kind of talking about this, and I shared that I wondered if any of this mattered to God or if making things pretty is just more of a self-serving hobby or something. And dangit, if she didn't just immediately stop my brain in its tracks when she said something to the effect of "I don't think it's surface - the Bible tells us that God has gone to prepare a place for us. He's preparing a home for us." And immediately I got a little choked up because I had never thought of it like that before. I thought about that for the next couple of days, and the word "prepare" stayed close to my heart. I decided to look up the origins of the word plan / prepare and one of the Latin words it derives from is Paro. I gotta come clean and say I never learned Latin, but this is a method that worked for JK Rowling, and I gotta throw some cred to my girl Shannon who encouraged me to look deeper into words to find something really meaningful and special. When I saw Paro I knew that was for me. Named and claimed. BOOM. 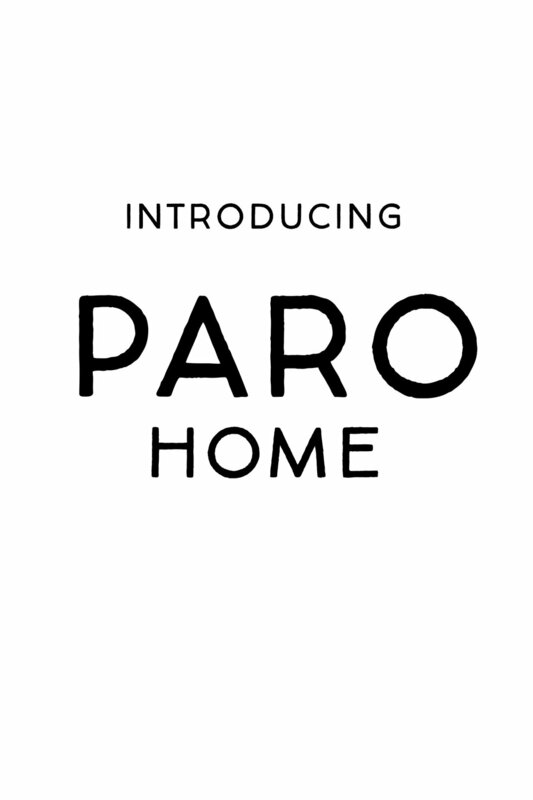 My hope for PARO HOME is that I can continue to use this name to prepare as many homes as I can for as long as people let me. I would love to not just prepare homes but prepare the things IN the homes - dreaming big, I would love to one day design things for the home, but I'm trying not to get ahead of myself! For now, as I plan our flip houses and imagine the owners meant to turn the house into a home, I get excited to prepare all of the details and choose the finishes that I hope reflect creativity, love, and thoughtfulness.